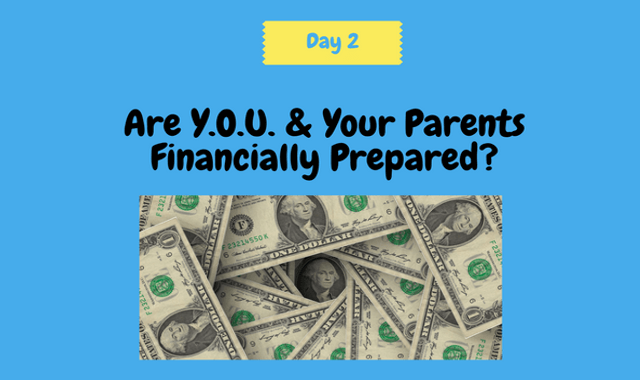 Day 2: Are You & Your Parents Financially Prepared? Have you spoken with your parents about their finances and how much they have saved for long term care? If not, you should. If you don’t, you may get stuck, as a family member, for some of the financial burdens on top of those you will already have as a caregiver. We’ll discuss this topic on Day Two of the 30 Day Preparation Plan To Care For An Aging Parent. Welcome to the Raising ‘Rents Podcast. This show is sponsored by ComForCare, a national home care provider that will help you live your best life possible. Day Two of the 30-Day Preparation Plan is the next step in preparing a plan to become a caregiver. Keep in mind as we go throughout this process that our primary goal for family caregiving, regardless of circumstances, is to provide a loved one with a comfortable, caring environment in which to grow old. On Day One, we talked about how the first step is all about Y.O.U. – “Y” is for Your well being, “O” is for Overall financial situation, yours and your parents, and “U” is understanding your parents’ needs. Today we discuss “O” – Overall Financial Situation – which is not an easy subject to broach with a parent or an aging adult. You are probably wondering why You are in the picture when it comes to your parents’ financial matters. I am sure you are thinking this is very uncomfortable, your parents know how to manage their money, and they would never ask for anything from you. Well it’s not that simple. Let me share with you some findings. AARP in 2008 has found that someone who is caring for a loved one and lives nearby can have annual expenses of $4500 annually as it is related to that care. Caregivers who live with the person they are caring for can have expenses up to almost $5900 on an annual basis. Long-distance caregivers have the highest annual expenses (about $8,700). You have to be prepared for these expenses because many times, especially after falls or sudden illnesses, you are faced with unexpected expenses. When my father had a stroke and then later fell in his home and broke his back, I had to take a plane home early from Europe which was an added expense, take two weeks away from my business which was a loss of marketing time and potential revenues, and fly to North Carolina twice from New Jersey. The issue is not that I wouldn’t drop everything and care for my father—I did that. The issue is realizing after the dust settled that I had not properly planned for emergency expenses as it pertains to my parents. So those are a caregiver’s costs. What do you think it costs your Mom or Dad’s for care? According to Genworth, a long-term care insurance company who collects this data, the following list is what it costs for the various options of long term across the U.S. in 2017 on a MONTHLY Keep in mind these are just medians. The ranges can vary significantly according to where you may live (You can search any area on their website for this specific information). Homecare: around $4,000 a month which is $48,564 a year; by the way, if you broke it out to let’s say $23 an hour, that comes out to almost six hours a day. Even if they can and want to remain at home for the long term, typically renovations are needed to keep some of these older homes safer such as new bathrooms that are easier to get in, higher toilets, showers instead of tubs, grab bars, ramps, electric beds, etc etc. These are unexpected costs. The other reason You are in the picture is because the more financially sound you are, the more cool you are with money matters, the more fiscally responsible you are, the more resourceful… the better position you will be in to help others. Whether it is a knack for creating and managing budgets, working for a good employer with great benefits, or the ability to look at the big picture and strategically plan for the future, your ability to be resourceful with finances for yourself and your family will come in handy when critical decisions need to be made. The worst thing that can happen is that parents unintentionally leave loose ends for their children and caregivers to deal with and there isn’t enough money to go around. Yes there is Medicaid as the last option, but even with Medicaid you have to plan that accordingly and if handled poorly, can still cost family members expenses they were not expecting. The tricky part is putting your nose in your parents business while making sure they retain their independence and decision-making. We have to be respectful. If a parent cannot participate in their own financial planning, that is a different story—you as caregivers must step in. Just make sure you have discussed with any siblings, if you have any, way in advance, what the plan will be and what the roles are if and when this situation comes up. I have seen a few family fights right in front of me and they were not my family! Frequent family meetings are a good idea to keep everyone on the same page and roles assigned and understood. For example, one person runs the checkbook. One person does the investment and savings end of it. One person handles the home/property and expenses related to it, etc etc. You want to encourage fiscal responsibility–It is imperative a person of any age lives within their means. Working relationships with bankers, investment professionals and/or accountants help seniors stay abreast of any changes in their financial health. These people are also an important resource to caregivers in times of crisis. Know where to find important documents—A loved one’s will is the most obvious document family may think to have access to. Though wills are essential, there are many other documents a financial caregiver needs. Insurance policies, pension records, bank books are just a few. A caregiver should take time to locate these as soon as possible, so in the event of an emergency, the financial response is organized. Obtain access to secure confidential information–In today’s world of top-secret codes and passwords, a social security number no longer guarantees open-book access to personal records. He or she may need to become a joint owner of an account, or make arrangements through the financial institution to be able to conduct transactions. Consider automatic payment or direct deposit options–Many seniors can benefit from the online payment options most companies are offering their clients. A caregiver can easily set up monthly debits from a loved one’s checking to pay utilities, insurance, mortgage bills, etc. The payment will most likely be linked to an email address, which allows a caregiver to see when payments are made, and ensuring they are. You may may want to consider the direct deposit feature offered by Social Security, pension funds, etc. Anticipate future expenses-– Take an inventory of assets versus debts to determine a loved one’s actual net worth. In addition to medical services, home adaptations or living expenses may be changing frequently. Agencies which provide these types services can provide estimates. A good caregiver, however, knows to always be prepared for both the expected and the unexpected. TAKING CARE OF YOU—let’s bring it back to you again. —Caring for another is a large responsibility, especially since many caregivers are near or at retirement age themselves. Caregivers should have a personal financial plan in place, as well as another plan drawn up for their loved one. A good plan includes a monthly budget with expenses and income listed, review of health insurance plan(s) and what is covered, and assessment of assets and debt. There are also resources available for caregivers to find financial relief. On a national level, the National Family Caregiver Support Program (NFCSP) has been created to help relieve financial hardships for unpaid caregivers. It was developed in 2000 by the U.S. Department of Health and Human Services’ Administration on Aging, and offers a range of services to support family caregivers., Caregivers should also contact their tax adviser or the Internal Revenue Service to find out what deductions may be available to them. If providing full-time care to a loved one, it may be possible to claim that person as a dependent. Three other agencies are available for caregivers to gather information. First, the National Center on Caregiving, established in 2001 as a program of Family Caregiver Alliance, works to develop cost-effective programs for caregivers. Second, the National Alliance for Caregiving, is another non-profit with information for caregivers and access to resources. Last, the Eldercare Locator,a public service of the Administration on Aging provides instant connection for seniors needing local connections. So that’s Day 2. Join us for Day 3 as we go to the letter “U” in the word YOU—Understanding Your Parents’ Needs. Thank you for listening to the Raising ‘Rents podcast Episode 11. If you have any questions or feedback, please go to our website www.raisingrents.com and click on the “Contact” tab. You can also find the show notes and references to anything we talked about. Until we talk again, remember that our parents raised us, the least we can do is help raise them. Talk to you later.